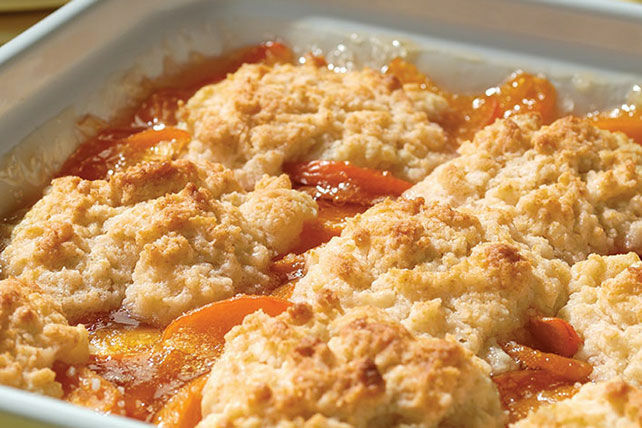 This homemade cobbler dessert recipe is one of the most delicious ways we know of to celebrate apricot season. Combine apricots, 3/4 cup sugar and tapioca in medium saucepan. Stir in water. Bring to boil on medium heat, stirring occasionally. Pour into 9-inch square baking dish. Mix flour, 2 Tbsp. sugar and baking powder in medium bowl. Cut in butter with pastry blender or 2 knives until mixture resembles coarse crumbs. Add milk; stir until mixture forms soft dough. Drop by heaping tablespoonfuls onto fruit mixture.